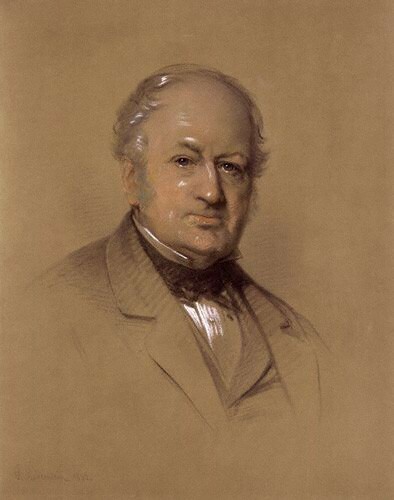 Bio Notes: Edward Blore was born in Stamford in 1787, the eldest son of Thomas Blore, a lawyer who was also a prominent antiquary. He began his career as an artist with the illustrations for his father's 'History of Rutland' published in 1811. This resulted in commissions for other topographical volumes and from John Britton for drawings for both 'The Cathedral Antiquities' and 'The Architectural Antiquities'. In Scotland he was engaged by Sir John Hall to illustrate his 'Essay on the Origins, History and Principles of Gothic Architecture', published in 1813. In 1816 he was illustrated to Sir Walter Scott as illustrator and manager of 'The Provincial Antiquities and Picturesque Scenery of Scotland', published in 1819-22. In parallel he provided Scott and his architect William Atkinson with details 'in the old fashioned Scotch stile' for Abbotsford, and it is not improbable that the knowledge of English gothic detail he had acquired while working for Britton was extensively applied to its neo-Tudor interior work as well. Blore never served any formal articles and probably learned the business of building from Atkinson and the Smiths of Darnick. The building of Abbotsford also drew Scott's neighbours, the Heitons of Darnick, into architecture: William Heiton joined Blore, while Andrew presumably joined Atkinson, as he was based at Inchture on the Rossie estate when his son Andrew Heiton II was born in 1823. In 1824-27 Blore built Corehouse, Lanarkshire, for Scott's friend George Cranstoun, Lord Corehouse, and in 1825-26 he and Burn jointly reconstructed Freeland, Perthshire for Lord Ruthven. Although their relationship seems to have gone sour, the pioneer Cotswold Tudor of Corehouse formed the starting point for Burn's smaller-scaled cottage houses beginning with the similarly-styled Snaigow designed in 1824. A common interest in collecting brought Sir Samuel Meyrick into Scott's circle and resulted in the commission for Goodrich Court, Herefordshire where William Heiton was in charge from 1829 until his death in 1833. A third Heiton brother, Francis, was put in charge of the building of Blore's Alupka Palace in the Crimea in 1832, and died there in or before June of the following year. Although never attached to the Office of Works, Blore was engaged to complete Buckingham Palace in 1832 and was consulting architect on the Glasgow Cathedral works of 1846 to 1849 which were carried out by William Nixon and Robert Matheson. In parallel Blore was consulted on John Baird's scheme for the proposed college of the University of Glasgow at Woodlands Hill in 1846 and at the suggestion of the Treasury he provided revised elevations to cut costs in 1849, the year of his retirement from practice. A knighthood was offered at that time but declined. Blore died at his house in Manchester Square, London, on 4 September 1879. Mounteviot Roxburgh Roxburghshire Scotland Date not known.